You can see, hear and buy some of my arrangements at http://www.scoreexchange.com/profiles/polishedbrassmusic. If you would like an arrangement written for your event or ensemble, please contact me here and let me know what you have in mind. Kevin Duggins is a trombonist and arranger living in the Minneapolis area in Minnesota, U.S.A. 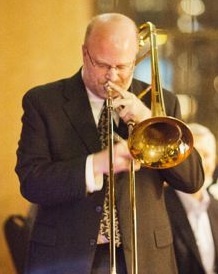 He plays in several groups in and around Minneapolis, and writes arrangements for Celebration Brass and other brass groups. He has earned a Master of Music degree in Trombone Performance from Indiana University.